Head Brewer at Indian Joe Brewing, Certified Cicerone® with 19 homebrewing awards & 7 of (what used to be) 23 BJCP beer categories conquered. Once again it has been far too long, but I have exciting details about our first beer! I mentioned in my last post that we had been experimenting with a 100% Brett kettle-soured Gose. Well now, I’m happy to report we made 10 bbls (310 gallons) of that bad boy! The entire funk fiasco originated from a conversation I was having with my buddy Joe Flores, recent GABF Bronze winner and Head Brewer of Aftershock Brewing. I asked if he was interested in brewing something together or wanted to collaboratively funkify a beer he had done before, and he suggested his Gose. Until that day, I hadn’t really considered taking a stab at putting my own spin on the style. Our water is already pretty salty and I’m a little burned out on coriander. But the gears started turning and over the course of a few emails, We Can’t Stop Here! 100% Brett Gose was born. Here’s a clip from Fear & Loathing in Las Vegas for those of you that aren’t the voracious fans of that movie that Joe & I are. We fired up our Gose on a grain bill of 50% Rahr Pils, 40% Rahr Red Wheat, & 10% Gambrinus Light Munich. Starting gravity was 1.048 and using Omega Lacto Blend we soured to 3.21 pH overnight. We boiled the next day and hopped with 7 IBUs of Lemondrop at 60 minutes. Small additions of Hawaiian Alaea red sea salt and coriander were included, but we weren’t looking for those to be focal points of the beer. Barrel 1: White Labs Brett Brux Vrai – I’ve never worked with the BSI Drei strain and was excited to try out the new White Labs version; especially after finding out that Brett Brux Trois was not actually Brett. The beer is still in the barrel, but the latest tasting notes are some really nice fruity notes including stone fruit and faint strawberry. It’s certainly hard to completely differentiate between possible wine and Brett contributions. Barrel 2: Giga Yeast Sweet Flemish – We found this strain to be pretty ready to rock and the Giga guys were great to work with. Interestingly, it had some pretty big fresh cut green apple flavors to it for a while. As it nears 3 months in the barrel, it seems to be morphing towards more grape skin and light funk flavors. That could certainly be the barrel contributing more. We may play around with some wine must in this one. Barrel 3: Yeast Bay Lochristi Blend – This gorgeous blend was the highlight of our pilot batch, and it shined again for the real thing. It gives off such a fun mix of light fruit, funk, and its own acidity that really can give a kettle sour unbelievable complexity. We pulled this barrel last week and served some at Backyard Bottleshop in Murrieta, CA for their anniversary events this week. We had a great time partying with them and we’ve been really grateful to hear all the kind words (and see the good ratings) for our first release. Barrel 4: Yeast Bay Brussels Blend – I expected this to be a pretty funky, beer geek only affair and it’s certainly on the right track. The nose is really complex and is starting to get very geuze-like. There’s some mousy funk lingering, but it’s good enough that we debated releasing this one first instead. I’m really excited to see the finished product. Barrel 5: Yeast Bay Amalgamation Blend – This is the only barrel we pitched with Brett that we had already grown up from subsequent brews. I’ve found this blend to be pretty reliably loaded with funky peach and mandarin orange and some background white winey notes. Early on it seemed like we underpitched it a little, as sulfur and rotten egg were overpowering the notes I’ve come to know and love. They’re just finally fading out, leaving a pretty interestingly funk-forward beer. I can’t guarantee a “pull date” on this one, but it will be fun whenever it comes out. Possibly with some citrus fruit. This wouldn’t be a typical post for me if I weren’t also sharing my excitement with what else we have coming down the pipeline! First is an Imperial Oatmeal Amber wort fermenting solely on the Yeast Bay Lochristi Blend. We emptied Barrel 3 for local Gose consumption and went ahead and loaded up another weird project. This too was an Aftershock & Relentless production. We also have an incredibly potent Tequila barrel filled with 100% Brett Imperial Spelt Gose. I decided to blend White Labs Vrai & Yeast Bay Lochristi Blend, based on the flavors we were getting from the Gose. Unless we blend this bad boy down, you’ll be too focused on the margarita in your glass to know it’s Brett at all. I do expect it to be popular for us and clock in around 10.5%. We also will field any and all billion dollar offers to take it global! In that vein, I found this Modern Times post funny. We split that brew into 2 barrels. The first, a fairly mellow and lightly leaky Tequila barrel. We co-pitched Yeast Bay Saison Blend 2 and East Coast Brett Custersianus. On day 3 we added 5.5 lbs of blue agave nectar as well. We’re expecting weird and fruity things. At this point that barrel is technically some sort of strange Imperial 100% Brett Wild Ale that may or may not get moved into a Tequila or Corn Whiskey barrel. Not to mention it also got 5.5 lbs of agave nectar. Stay tuned, as the direction of beers and the whims of your beloved cellarman are unpredictable. Finally, big thanks to the Milk The Funk group on Facebook. I’m continually learning new things and absorbing useful information from the fine funky folks there. I highly recommend it if you find anything that you just read interesting. Time to cook some steaks and crack something sour. Stay thirsty my friends! Getting Started with Relentless Brewing! 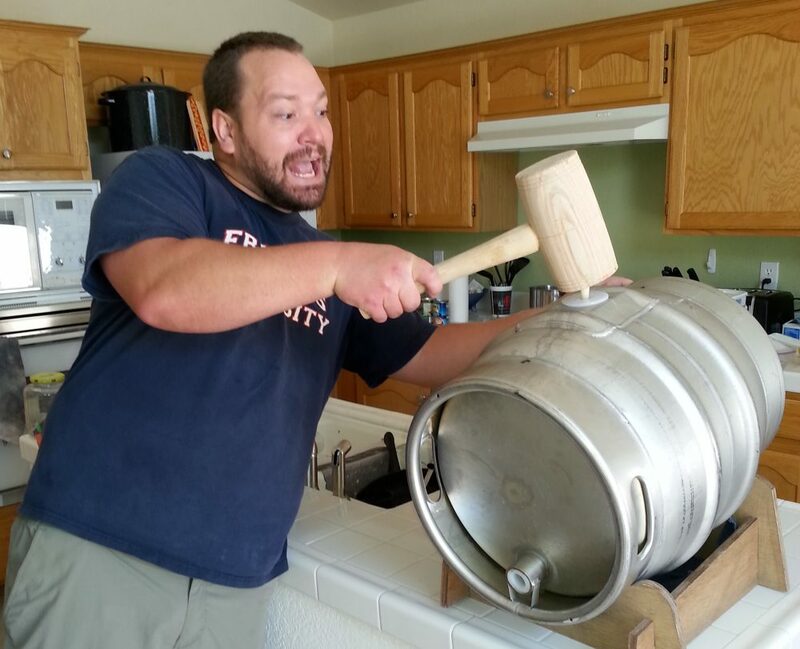 Refuge Gone Wild: Fun With Brettanomyces! Working For @RefugeBrewery And Moving At The Speed Of Life!